RAM and ROM are both different types of memories used in any computer to make it fast and to enable it to access information stored in the computer. Every computer comes with a certain amount of physical memory which is actually chips that hold data. This memory is referred to as Random Access Memory or RAM. RAM is a part of hardware that stores operating system’s application programs and currently running processes that can be accessed randomly, i.e. in any order that the user desires. Data in RAM stays for only as long as the computer is running, and gets deleted as soon as computer is switched off. RAM usually comes in the form of microchips of different sizes such as 256MB, 512MB, 1GB, 2GB etc. Computers are so designed that this RAM can be increased up to a certain capacity. ROM, on the other hand refers to Read Only Memory. Every computer comes fitted with this memory that holds instructions for starting up the computer. This is a memory that has data written permanently on it and is not reusable. 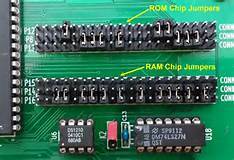 However, there are certain kinds of read only memory that can be rewritten but they are called Erasable Programmable Read Only Memory, or EPROM. These are generally in the form of CD-ROM or Floppy Disk that can load the OS to the RAM. Similarities between RAM and ROM end up with both being types of memories. There are glaring differences between the RAM and the ROM. • RAM is Random Access Memory, while ROM stands for Read Only Memory. • RAM is volatile and is erased when the computer is switched off. ROM is non-volatile and generally cannot be written to. • RAM is used for both read and write while ROM is used only for reading. • RAM needs electricity to flow to retain information while ROM is permanent. • RAM is analogous to a blackboard on which information can be written with a chalk and erased any number of times, while ROM is permanent and can only be read. One example is BIOS (basic input output system) that runs when computer is switched on and it prepares disk drives and processor to load OS from disk.